Boaters who did not elect to overnight in LaConner might well decide to put into Anacortes. There’s a great public marina at Cap Sante. Anybody bypassing Anacortes will typically use Guemes Channel between Fidalgo and Guemes Islands as an approach to the final crossing prior to the San Juan archipelago. (It should be noted that Fidalgo Island, site of Anacortes, is often numbered among the San Juan islands but most boaters consider that they aren’t quite into the San Juans when reaching Anacortes). Currents can be a consideration in Guemes Channel, but unlike Deception Pass the currents won’t present a specific hazard. Keep an eye peeled for commercial traffic, as well as the small ferry crossing from Guemes to Fidalgo Island. Just before Guemes Channel intersects Rosario Strait, there is an active Washington State Ferry Dock on the Anacortes side. The ferries can seem to appear suddenly, and will overtake slower vessels very quickly. It is prudent to stay out of their way. Rosario Strait is a much shorter crossing than the Strait of Juan de Fuca, and hasn’t earned the same fearsome reputation. Nevertheless, Rosario should command respect. When wind and current are opposed, steep waves can pile up in Rosario. Our prevailing winds are north and south, and most passages across Rosario are east and west. It isn’t unusual to encounter some serious beam seas in a crossing. If the weather radio is reporting strong winds in Rosario, it may be wise to put into Cap Sante and wait for calmer conditions. 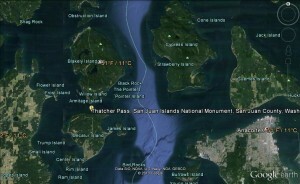 Boaters who run from Anacortes into the San Juans very commonly enter the islands through Thatcher Pass, between Decatur and Blakely Islands. This is the same route that ferries follow between Anacortes and various San Juan ports. Ferries are a potential hazard anywhere beyond the Anacortes Ferry dock, and Rosario Strait is a busy route for tankers bound for the Cherry Point refinery. Boaters crossing Thatcher Pass will need to adjust steering to compensate for current. Expect to be swept either north or south of a rhumb line between Guemes Channel and Thatcher Pass.